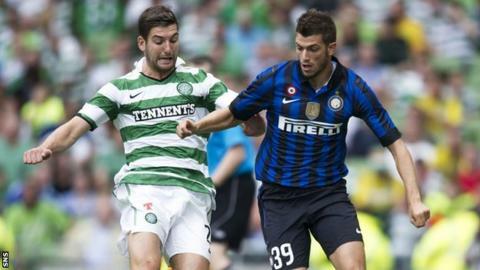 Celtic face a rematch against 1967 European Cup final opponents Inter Milan in the last 32 of the Europa League. They also met in the 1972 European Cup semi-final, the last competitive match between the two sides. The first leg is due to be played at Celtic Park on 19 February, with the return leg in the San Siro on 26 February. Celtic famously secured a 2-1 win in the 1967 final in Lisbon. Sandro Mazzola fired the Italians ahead but goals from Tommy Gemmell and Stevie Chalmers ensured Celtic became the first British side to win the top trophy in the European club game. In 1972, the sides played out two goalless draws and Inter won 5-4 on penalties to reach the showpiece, which they lost 2-0 to a Johan Cruyff-inspired Ajax side. Two legs to be played on 19 and 26 February 2015. Inter won the Uefa Cup, which was replaced by the Europa League, in 1998 and they also lifted the Champions League trophy in 2010 under Jose Mourinho. The Milanese have suffered a slump in recent years, however, and currently sit 12th in Serie A. They sacked boss Walter Mazzarri in November and brought former Manchester City manager Roberto Mancini back for a second spell in the San Siro hotseat. Mancini enjoyed a successful first stint at Inter between 2004-2008, winning the Italian title three times. Celtic reached the knockout phase of the Europa League by finishing second in Group D behind FC Salzburg, and ahead of Dinamo Zagreb and Astra Giurgiu. Inter topped Group F, which included Dnipro, FK Qarabag and St Etienne, with the Italians going unbeaten in their six games. Former Celtic player Murdo MacLeod reckons Ronny Deila's men have enough to see off the Italians if they find their best form over the two legs. "It's a fantastic draw for Celtic, a massive big name, there's great history between the two clubs and now they're going head to head again," he told BBC Scotland. "I'm really looking forward to the game. "Just now Inter are 12th in their league, 19 points behind the leaders, so they're a long way off. "In Europe they've been strong and topped their section, so maybe they've been concentrating more on the Europa League. Over the next few weeks I'm sure they will sort themselves out. "When Celtic are playing at their best they're a really good side and are hard to beat. If they bring in one or two better quality players in January it's going to be a stronger squad and you've got to hope that on the night Celtic put on a really good performance that they are capable of. If they do that they will be hard to beat and Inter Milan will find it tough. "Of course Celtic can go through. If Celtic play I think they are a better side than Inter Milan just now."